Self-mutilation, self-amputation, separation of a body part: it all comes down to one thing – autotomy can be ‘Life over Limb’! As a little girl, I remember watching in horror as a lizard I was trying to protect from my pet cat suddenly ran off without its tail, leaving my cat and I staring in bewilderment at a wriggling lizard tail. I now know that this was a great example of ‘autotomy’. Autotomy is a self-defence mechanism that many animal species can utilise. For example, if a predator seizes the tail of a striped skink, the skink can detach its tail from the rest of its body, sacrificing the tail, but escaping with its life. 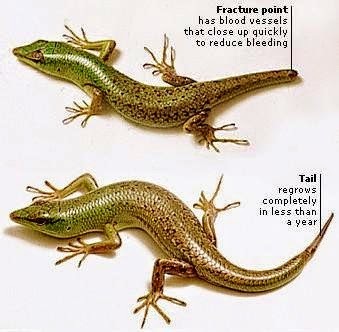 If the predator does not consume the tail, the skink may return to the 'scene of the crime' once the predator has left and eat its own discarded tail. 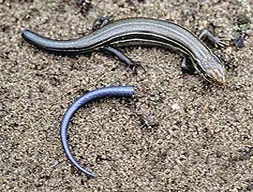 As the skink’s tail is an important site for the storage of nutrients, the skink can ‘win back’ some of the nutrients lost in the fight (glad I’m not a skink). Further, in the case of the striped skink, the animal can regenerate the sacrificed tail. So the question remains - despite its immediate advantage in terms of survival, does autotomy have a downside? The answer is most likely 'yes'. The animal could have impaired locomotion and reduced ability for foraging in the event a limb is lost...and even limited reproductive options if the detached body part is important for mate attraction.